Emphysema - catch, body, causes, What Is Emphysema? Emphysema (em-fe-ZEE-ma) is a lung disease in which the alveoli (al-VEE-o-ly), tiny air sacs in the lungs, lose elasticity, causing difficulty in breathing. Air reaches the lungs through a series of ever-smaller tubes. First air passes through the trachea (TRAY-kee-a), which is the large windpipe from the throat down the neck. Then the trachea branches into smaller tubes called the bronchi (BRONG-ky), then into even smaller bronchi called bronchioles (BRONG-kee-olz) that branch still further deep into the lungs. The bronchioles end in tiny air sacs called alveoli. It is in the alveoli that the transfer of oxygen into the bloodstream and of carbon dioxide out of the bloodstream occurs. In emphysema, the bronchi and bronchioles are inflamed and continually swollen and clogged. This causes the alveoli to swell. These fragile air sacs burst and merge together. This damage to the alveoli makes it more difficult for the transfer of oxygen and carbon dioxide to take place. People with emphysema have difficulty breathing. It is usually caused by cigarette smoking, or a severe form of bronchitis called chronic obstructive bronchitis. Very often, a combination of these factors produces emphysema. Because severe bronchitis, smoking, and emphysema are closely interrelated, physicians often refer to a combined disorder known as chronic obstructive lung disease (COLD), or chronic obstructive pulmonary (PULL-mo-nar-ee) disease (COPD). Both emphysema and COPD are very rare in young people, but the incidence * steadily increases as people grow older, particularly during or after middle age. This is believed to be due in large part to the cumulative effect of smoking on the lungs. One person cannot catch it from another. Emphysema is more common in men than it is in women, probably because more men smoke cigarettes than women. However, it is believed that this difference will become smaller because more teenage girls and young women are smoking cigarettes today than years ago. Heavier smoking among men over the past several decades is believed to account for the present imbalance in numbers. In the United States, more than 2 million people have emphysema, making it a common disorder. More than 6 million people suffer from COPD. About 6 or 7 people per 100,000 die from emphysema each year, and COPD is the fourth most common cause of death in the United States. The incidence of emphysema is even higher in European countries. The great majority of emphysema cases are associated with cigarette smoking. It has been found that people who are heavy smokers of cigarettes are 10 to 15 times more likely to develop emphysema than are nonsmokers. Additional factors may contribute to emphysema or be directly responsible for it. For example, if someone develops emphysema early in adult life, usually it is due to a rare genetic deficiency of a chemical that helps to maintain elasticity * in the lungs. Environmental air pollution also may make a person more likely to develop chronic bronchitis and emphysema. With on-the-job exposure to mineral dusts, such as coal dust in a mine, emphysema may occur as part of a disease known as pneumoconiosis (noo-mo-ko-nee-O-sis). Sir John Floyer (1649—1735), an English physician who had asthma, first described emphysema in the seventeenth century. Floyer was studying pulmonary (lung) disorders and described the characteristic prolonged expiration and progressive nature of emphysema. Floyer warned his patients to avoid tobacco smoke, metallic fumes, and other potential irritants because he believed that they caused pulmonary disorders. He was right. * elasticity is the ability to be stretched and to return to original shape. Emphysema also may accompany diseases such as asthma and tuberculosis that can obstruct the airways in the lungs. A less serious form of emphysema sometimes develops in elderly people whose lungs have lost elasticity only as a part of the aging process. Another usually mild form, called compensatory emphysema, results when a lung overexpands to occupy the space of another lung that has collapsed or has been removed surgically. Healthy lungs (left). Lungs with emphysema showing damaged alveoli (center). Close-up of damaged alveoli. Understanding the alveoli, and the airways in the lungs that lead to them, is key to understanding emphysema. These tiny sacs or pockets are grouped in grapelike clusters and are so small that each lung contains 300 to 400 million of them. Because there are so many alveoli, their total surface area is about 50 times greater than the entire surface area of the skin on the body. This huge surface area is important because it allows oxygen from the air we inhale to be transferred to the bloodstream, and it allows carbon dioxide in the bloodstream to be transferred out. Inhaled air reaches the alveoli through bronchial tubes and repeatedly branching smaller bronchioles in the lungs that resemble an upside-down tree. The walls of the alveoli contain tiny blood vessels called capillaries, which lead to larger vessels that return blood to the heart to be pumped throughout the body. It is in the delicate capillaries of the alveoli that the transfer of oxygen and carbon dioxide takes place. What Changes Occur in the Lungs from Emphysema? In emphysema, tobacco smoke and other inhaled irritants damage the alveoli, causing them to lose elasticity. Moreover, smoking often causes chronic bronchitis, which tends to narrow and obstruct the bronchial airways with mucus, scarring, and muscle spasms in the walls of the bronchial tubes. As a result, air becomes trapped in the alveoli, stretching their walls and causing some to break down and form larger pockets by joining with other alveoli. As the lungs become less elastic, they tend to become distended, or overinflated. All living things need energy for their life processes, such as growth and reproduction. Plants get energy from the sun, whereas animals get it from food (plants and other animals). Because humans are animals, we might think we could get energy just by eating food, but this only gets the food to our stomachs; it does not get it to all the cells of our bodies, where it is needed. For this purpose, our digestive systems break down the food into sugar, fats, and proteins, and our circulatory systems carry it to our cells as food energy in this form. This is still not enough to help our cells, however. The cells need to have oxygen from the blood to be able to carry out chemical reactions to release the energy from the food we eat. We breathe in so that our lungs can transfer oxygen to the bloodstream for delivery to our cells. We breathe out to carry away carbon dioxide, a waste product of the chemical reactions in our cells, that is returned in the bloodstream. The main symptom of emphysema is shortness of breath. The decrease in lung elasticity, the trapping of air in the lungs, and the loss of alveolar surface area means that the person must breathe harder to force carbon dioxide out of the lungs and draw in oxygen. A common outward sign of emphysema is a barrel-shaped chest caused by overinflation of the lungs. As emphysema progresses, some people compensate by breathing faster. Others develop a condition known as cor pulmonale (KOR pul-mo-NAL-ee), in which the right side of the heart becomes enlarged because of the difficulty it has pumping blood through the damaged lungs. 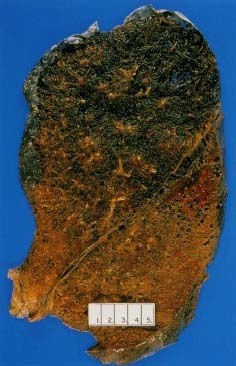 A slice of human lung tissue with pulmonary emphysema. The affected lung area is the top portion, with severe lung damage in the blackened area. Normal lung tissue is shown on the bottom for comparison. Dr. E Walker/Science Photo Library, Photo Researchers, Inc.
How Is Emphysema Diagnosed and Treated? A doctor can diagnose emphysema from a physical exam, symptoms, and a chest x-ray, which may show such signs as overinflation of the lungs and other changes. A lung function test can detect reduced ability to exhale fully. Blood tests can measure the concentrations of oxygen and carbon dioxide in the blood. Blood levels of carbon dioxide tend to rise in patients with emphysema, and blood levels of oxygen tend to fall. Currently no form of treatment can reverse emphysema, but measures can be taken to control the disease and its symptoms. The person must stop smoking permanently. Antibiotics may be used to treat and prevent respiratory infections. Other medicines can be taken to widen the airways and relax spasms in their walls. Special breathing exercises often are helpful, and breathing equipment that delivers extra oxygen and medications may be provided for home use. Because the damage that emphysema does to the lungs cannot be undone, it is especially important to try to prevent this disease from developing in the first place. Adopting healthy habits early in life—especially not smoking—is very important. It can prevent health problems later on that include not only emphysema, but lung cancer, heart disease, and other disorders as well. Haas, Francois, and Sheila Sperber Haas. The Chronic Bronchitis and Emphysema Handbook. New York: John Wiley and Sons, 1990. This is a well-written and well-illustrated source. Adams, Francis V. The Breathing Disorders Sourcebook. Los Angeles: Lowell House, 1998. This book has more information on lung conditions, including a chapter on emphysema, and lists many helpful local and regional organizations. 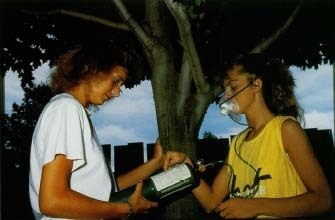 A young woman with emphysema shows her portable oxygen tank to a friend. © 1992 Amy Meister, Custom Medical Stock Photo. locate a local office by calling 1-800-LUNG-USA (586-4872). The Association's website includes valuable information about lung diseases and tobacco control. Material is available in English and in Spanish. I saw an autopsy in Nursing school. The older cadaver had smoked most all his life. His lungs were as black as coal, had a terrible odor to them, and were not 'cushy' feeling. There were hard and pieces readly broke off. They were full of holes. I will NEVER forget what I saw. The sample healthy lung brought in for demonstration, was pink, 'cushy', had no odor, and was intact. This sparked my interest in Respirtory Health. I grew up wishing I had been a Thorasic Physcian, operating on lungs and such. My Sister has been smoking since she was a child, and is now in her mid 50's. I have Never! smoked and am healthy! I wait for the phone call, that my Sister is hospitalized for cancer, COPD, stroke, heart attack, pneumonia, or something else. Thankyou Jesus I NEVER smoked!!! Hi there, Please can anyone give me advise or be able to tell me that they have been through the same thing and how they are coping.